Not to be confused with bierocks or pirogues (although very similar) runzas are well known specifically throughout Nebraska. The runza was carried over to the United States in the 1800s from Russia and Germany. There are many different runza recipes and casseroles, but the main ingredients are beef, cabbage, onions and spices. Runza is also a staple fast-food chain that serves these delicious savory filled bread pockets throughout Nebraska. Stop for one next time you’re in the state! 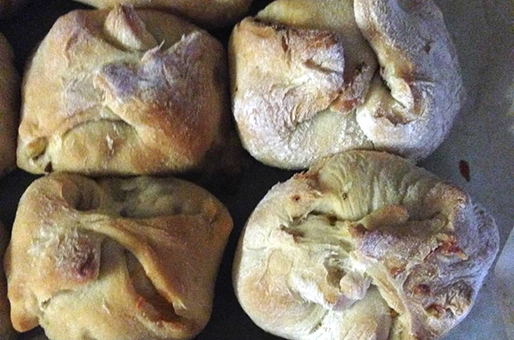 Try one of our favorite recipes below to make homemade runzas, just like Chicken Pot Turtle! Add a little ketchup on top or cheese in the middle, and yum, you’ll be going back for seconds. They are even served at Memorial Stadium for Husker football games. And if you live in Denver, visit Cap City Tavern during football season to cheer on the Big Red and order up their take on the runza. It’s simply scrumptious! While dough is thawing, cook the ground beef with the onion and add salt, pepper, crushed garlic, rosemary and thyme to taste. Roughly chop the cabbage and fry in butter to soften. Roll out dough to about 1/4 inch thick. Cut into 8 inch squares. Fill each square with the ground beef, cabbage and shredded cheese (as much as you want!). Fold dough over to form a triangle and pinch the edges to seal. Bake at 375 degrees for 20 minutes. Makes about 8 large runzas.